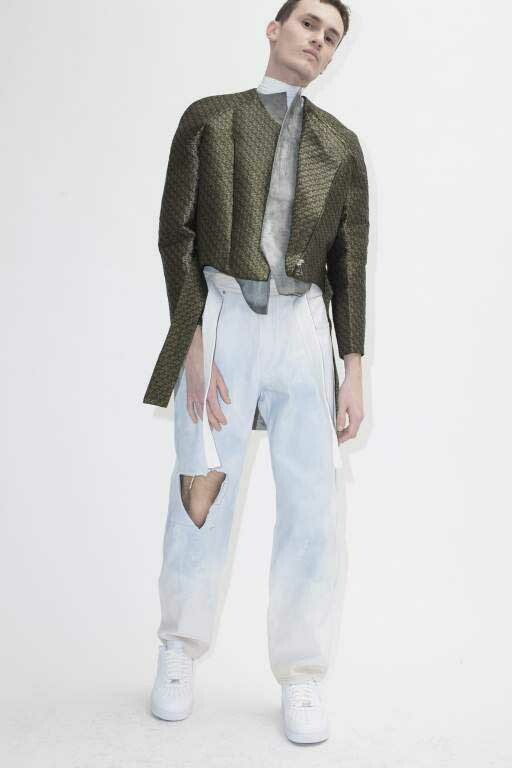 The autumn/winter 2014/15 collection by MARTIN NIKLAS WIESER is driven by a free-spirited urge for liberation. Classic beauty is eschewed in place of references from a motley of genres, styles, and eras. The collection looks at the effortless transition between high end and fast fashion in contemporary industry trends, the effect of which is a rendering obsolete of such distinctions. As quality and style become homogenized throughout the industry, price point has become the last vestige of luxury in fashion. The designs in the collection feature ironic touches (see the fringe-flared blue denims, or the 90s sportswear-inspired pieces) and weave them all into a larger story. These represent the contemporary style era, a seamless transcendence from one specific look to a tumbleweed of cultural appropriations. This cross-referencing of styles and subcultures has become a crucial element in the modern, every day clothing habit. Different textile techniques were employed to increase the “original” look of the referenced designs, such the bleaching and re-dying of denim and the patchwork in leather and jeans. Various textile designs were developed in collaboration with graphic designer Florentin Bodet, referencing 60s hippie prints and 90s graffiti art. The ultimate aim of the design was to create a modern result and attempt to put a finger on the collective sense of current style. Off-White X Mytheresa.Com Exclusive Collection Available Oct 18th.